Today I sat down at my computer to try and find updates coming from the M.O.M. March in Washington, DC. I really wish I could have gone, but other committments kept me away. Thank you to MAED, EDC, and the Alliance for Eating Disorder Awareness for pulling this whole thing together! I could feel the energy of those present being channelled through twitter and facebook and instagram. As a "Virtual Marcher" I knew that others, like myself, must be feeling a similar desire to make my presence felt among the crowd of purple and green T-shirts there on the national mall in front of the US Capitol. As Executive Director for F.E.A.S.T., I wear many hats - including that of website administrator. I realized that I could set up a quick online survey for other Virtual Marchers to be counted - to make their presence known. Numbers matter in a campaign like this. Only so many can afford the time or money to get to the march, but I believe it is important to measure those who were there in their hearts and on their phones and computers. At a few minutes after 3:00pm ET, The survey went live. I tweeted. I posted on facebook. I sent emails. I retweeted. I connected with other followers and soon the numbers started adding up. Tomorrow, those in Washington DC will march up Capital Hill for EDC Lobby Day. 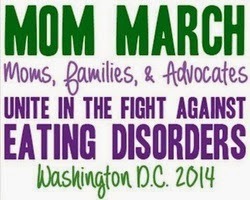 They still need our virtual support, as marchers, and as the voices of individuals and families. Let your voice be one that is heard! Follow THIS LINK to find out how to contact your legislator and magnify the messages they will be hearing tomorrow. The Washington M.O.M. March may be over, but the struggle against ED continues around the clock and around the world and we need to speak up as an International Community! So, I invite those of you who are just beginning your day, to put on your marching shoes and join us now, IN YOUR TIME ZONE, to keep the #MarchAgainstED going around the clock until Lobby Day is over! How many Virtual Marchers do you think we can count before then? Numbers matter! Let's show our friends on Capital Hill the strength of the community standing behind them!